Whether you are jet-setting off to an exotic destination or daydreaming from home, indulge your wanderlust anytime with these perfectly-sized travel companions. Gorgeous sheer color, skin-loving naturals and magical scents will instantly transport even the most seasoned adventurer. Travel well! 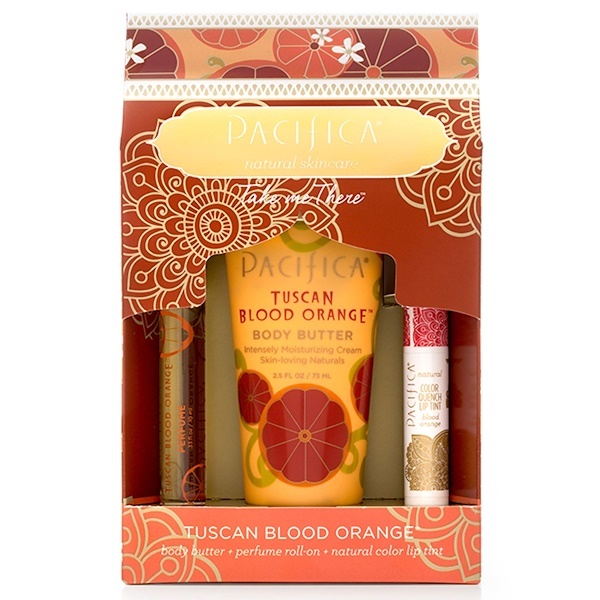 Pacifica's Tuscan Blood Orange is a blend of sparkling, juicy blood orange with notes of red raspberry and spicy sweet Italian mandarins. The scent of the Mediterranean beach. Aqua (purified, caprylic/capric triglyceride (coconut source), helianthus annuus (sunflower) seed oil, glycerin (vegetable source), glyceryl stearate (vegetable source), aloe barbadensis leaf juice, stearic acid (vegetable source), stearyl alcohol (vegetable source), butyrospermum parkii (shea) butter, allantoin, theobroma cacao (cocoa) butter, hyaluronic acid, simmondsia chinensis (jojoba) seed oil, xanthan gum (vegetable source), algin (algae source), riboflavin (plant source), mangifera indica (mango) butter, rosa rugosa (rose) seed oil, daucus carota (carrot) seed oil, aleuritus moluccana (kukui) nut oil, macadamia ternifolia seed oil, linum usitatissimum (flax) seed oil, mixed tocopherols (vitamin E), panthenol (pro-vitamin B), parfum (pacifica's own fragrance blend with natural and essential oils), cucumis sativus (cucumber) fruit extract, arnica montana flower extract, chamomilla recutita (matricaria) flower extract, camellia sinensis leaf extract, phenoxyethanol and ethylhexylglycerin (plant source). Denatured alcohol (natural grain), parfum (pacifica's own fragrance blend with natural and essential oils, aqua. 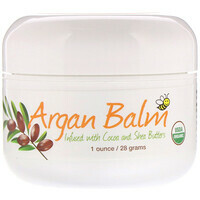 Cocos nucifera (coconut) oil, glycine soja (soy) wax, euphorbia cerifera (candelilla) wax, theobroma cacao (cocoa) seed butter, persea gratissima (avocado) oil, natural flavor, tocopherol (vitamin E), rosmarinus officinalis (rosemary) leaf extract. May contain: mica, titanium dioxide, iron oxides. 100% vegan. Cruelty-free. Formulated without FD&C colors, mineral oil, parabens, phthalates, petroleum, propylene glycol, SLS, sulfates, gluten, or peanut oil.